Dominic J Marshall is a pianist/composer/beatmaker from Wiltshire, England. He’s fast gaining reputation in his adopted country of The Netherlands as an exciting young musician mixing jazz with hip hop. 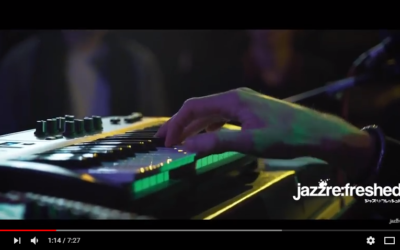 Run alongside his work with the Cinematic Orchestra, his trio was presented at last year’s North Sea Jazz Festival, on national Dutch TV and, back home, on the recent Jazz Re:Freshed series around the UK. His latest album THE TRIOLITHIC (Challenge Records) was released in September 2016 at the Bimhuis in Amsterdam. On this release, Marshall uses two different rhythm sections and involves elements from electronic and hip-hop music, distinguishing his unique sound from other jazz pianists. The CD was nominated for an Edison National Jazz award and received radio play on Jamie Cullum’s BBC 2 Radio show. In 2013 Dominic was awarded the Emerging Excellence award from Help Musicians UK to record his first professional album Spirit Speech (Origin records), on the strength of which he was selected unanimously by a jury of Jamie Cullum, Gilles Peterson and Jez Nelson to perform at ‘BBC Introduces’, Manchester Jazz Festival. Having graduated from the Conservatorium van Amsterdam, Dominic was lucky enough to receive guidance from the likes of Kurt Rosenwinkel, Brad Mehldau and Ambrose Akinmusire. His first trio recording The Oneness was made during this time, Chris Parker of LondonJazzNews calling it ‘a striking debut’. Drawing comparisons to Robert Glasper, he has 3 releases scheduled for 2018 including a hip hop covers cassette (!) and a vinyl. “He brings together a great heritage of the past, but also something very fresh and new."